Place a skillet over medium heat, coat with olive oil and pan brown the sausages, both sides 7-9 minutes, to an internal temperature of 165°F. Meanwhile, cook pasta according to package directions, drain and keep warm. 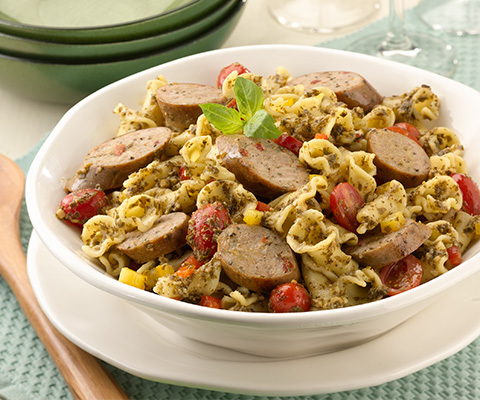 Slice sausages on the diagonal 1/4" thick, return to the skillet, mix in the pesto and the cooked pasta. Toss together and add the cherry or grape tomatoes. Serve immediately.